This is a bold, contemporary and hop-forward IPA from the son of a more traditional brewer, now operating a rival brewery under the same roof as his father. Using biscuity Maris Otter malt and a fruity selection of hops, it's wonderful with full-flavoured foods. 2015 IBC Gold Award Winner. The International Beer Challenge - London 2015, Gold.The West Coast An untamed wild frontier. Where storms blow in and winds whisper words of treason. The start of the Uprising... 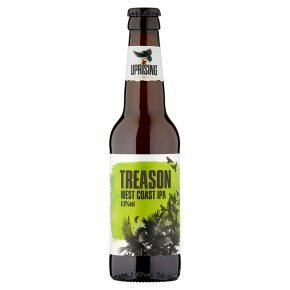 Treason is an awesome West Coast I.P.A. Burning bronze in colour with a big hop aroma that gives way to a lingering spicy bitterness. Rise. Take the Crown.